We eat a lot of dehydrated food while camping- especially when we hike in all our gear! Yes, it would be nice to have burgers and hotdogs but that would require towing a huge cooler about 5 miles. I wanted to make a real breakfast so I bought Bisquick pancake batter that required only water. I cooked it in a sauce pan which was a little difficult at first until I figured out how to be an expert sauce pan pancake flipper! They turned out great and it encouraged me to keep thinking out of the box with my backpacking food choices. The downside was the space it took up in my bag but it was worth it! Nice pancakes. Dont forget the powdered sugar and blueberries next time. Great idea! I’ll try that next time. I love love love the shaker of Bisquick! We use it all the time! 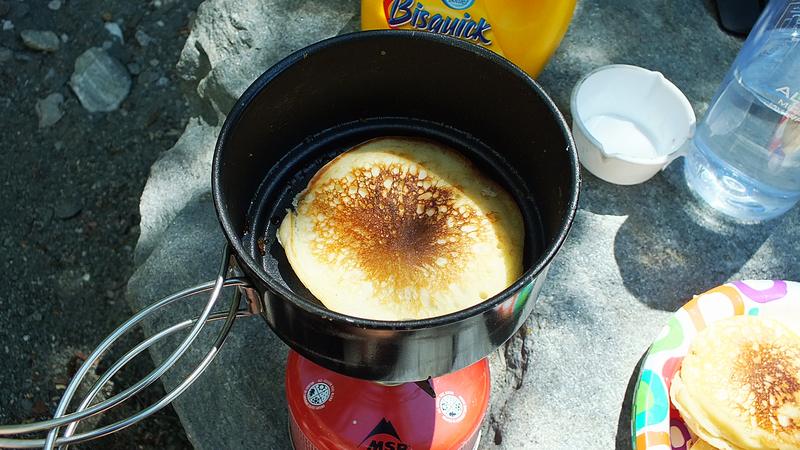 I use the “just add water” pancake mix all the time when we go camping in the desert, so easy, so quick and so yummy! Great post. camp food should be different from what you eat regularly. If it was the same, you might forget that the focus of the trip is about getting back to basics. It is certainly nice to have little luxuries and it can often be the simplest of things. We take home prepared pasta sauces with us – make them up and once cooled put into plastic zip-lock bags for ease of transport. They don’t take up much room. Then when at camp site they just need reheated. Yummo! Brilliant. I’m definitely going to try this. And plenty of wild berries around for me. Tho’ I actually cooked a local French vacuum packed bulgar wheat & veg burger today, over a tiny fire pit – bio & surprisingly tasty.